I know I’ve mention it before on this blog. It doesn’t take much for me to get excited about the details of a city, especially if it’s dark, with glowing lights and with a layer of well-earned patina. There’s a lot of this in Kyoto, because it’s an old place. The temples and shrines are great but they typically aren’t open at night. For my urban night photography, I ventured to the central core. 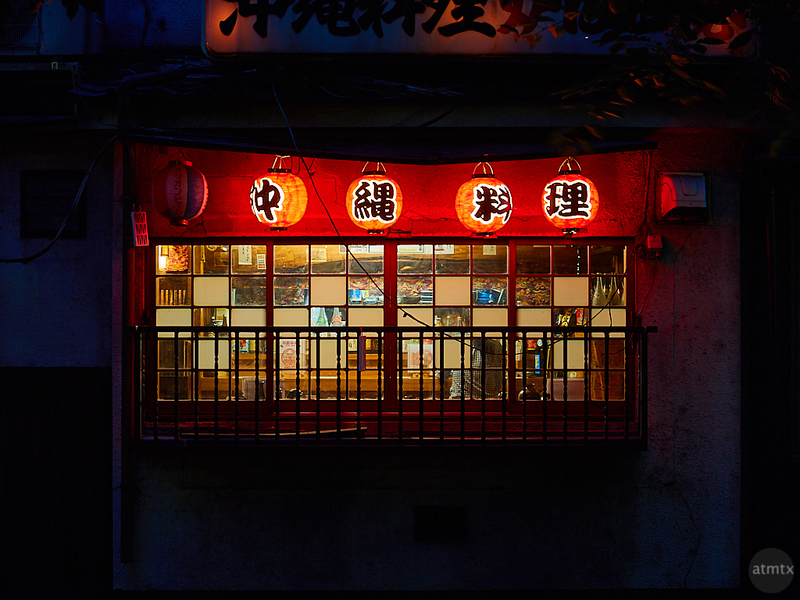 Glowing lights are a necessity but red lanterns are a wonderful plus, especially contrasting against blue hour, which unfortunately, you don’t see from this framing. At least there is a touch of blue surrounding the periphery. The window panes offer a multidimensional view into this modest restaurant and unexpectedly there’s sort of a disjointed head that appears in one of the panes. It’s a little eerie but probably nothing supernatural. This is the backside of restaurant along a small canal, which runs more-or-less parallel to the Kamo River in central Kyoto. As the title suggests, this is a first of a 3 part mini-series.